As you may know, Norway is now in charge of awarding the Nobel Peace Prize. To be part of the ceremony and dinner, you must be especially invited, but to visit the center where the prize is awarded is something that anyone can do. At the Peace Centre you can take advantage of the tremendous work that all the Peace Prize winners over the years have done to make themselves worthy of the prize, and you can also take the opportunity to learn more about Alfred Nobel. At the Peace Centre, you’ll also find several exhibits and other things where you can learn about war, peace and conflict resolution. There are also guided tours for those who want them. The Nobel Peace Centre is also great for youngsters. There are several children's activities that are related to the exhibitions displayed. Children may, for example, get the chance to learn more about the peace process and how they can contribute to this. Very close to Oslo city centre is the peninsula Bygdøy where, among other things, you will find royal buildings such as Bygdøy Kongsgård and Oscar Hall castles, beautiful parks and a large collection of museums. Some of the museums that are on the Bygdøy are the Viking Ship Museum, the Kon-Tiki Museum, the Maritime Museum, the Norwegian Folk Museum and Fram Museum. All of the museums are close together and you can quickly move between them on foot. A visit to this island is a must for those interested in the history of Oslo. In this museum you will find a superb collection of finds from the Viking era. There are grave finds made during the late 1800s and early 1900s containing tools and weapons from the Viking period. You can also see two Viking ships from the 800s which are among the world's best kept available at the museum. At the Kon-Tiki Museum, you can experience the history of Norwegian Thor Heyerdahl, who sailed from Peru to Polynesia to prove his theories of migrations in the Pacific. These include rafts which Heyerdahl and the crew sailed on and more information about Thor Heyerdahl's theories. The Kon-Tiki Museum suits both young and old. Oslo maritime museum has a lot to offer for the visitor interested in all things naval. Here you can learn about the Norwegian fishing industry, coastal life in Norway, marine archeology, shipbuilding, maritime history and much more. Inside the museum you can also see several models of different ships and varyious marine exhibits. If you want to obtain ample knowledge about Norwegian culture and history, should this museum be at the top of your "to do" list. Here you can experience nationwide cultural information about Norway and the Norwegian population. There are several exhibitions whose content varies, but what they all have in common is that they are based on collections of tracks from previous lives and activities in Norway. This museum tells the story of the Norwegian polar expeditions carried out by ship. Visitors have the opportunity to board the Front and feel what it was like to be on the world's largest and strongest polar ship during a polar expedition. Around the ship you can see stuffed polar animals, everything for visitors to get a real feel of the expeditions. Once you’ve walked around the streets and have a picture of how Oslo appears from the country, it may be interesting to see how the city looks from the sea. This is done best with a boat trip on the Oslo fjord. A trip on the Oslo fjord also provides the opportunity to go to various islands where one can investigate the Norwegian summer houses or just relax. If it’s summer time then it's perfect for bringing your bathing suits to take a cool dip. When you’ve decided to take a boat trip on the sea, there are several options. You can either take one of the boat tours offered to tourists or you can ride on the public ferries that Oslo residents use as a means of transport. Take yourself down to the harbor to see what suits you best. Castle Park in Oslo is completely open to the public and a visit here is ideal for those who want a break from the asphalt and concrete and instead take a stroll among the trees and shrubbery. Visitors can also see the changing of the guard at the palace which takes place every day after lunch. Watching at the changing of the guard, you should be able to notice whether music is playing or not. If music is played, then that means that the king is at home in the castle. In front of the castle you can also see the statue of King Karl Johan, who ruled Sweden and Norway, between 1818-1844. Holmenkollen is a modern ski jumping hill located in a residential district of the same name northwest of Oslo. This is an extremely popular tourist attraction which is visited by up to a million people each year. At Holmenkollen, you'll also find the world's oldest ski museum where you can experience 4,000 years of skiing history. 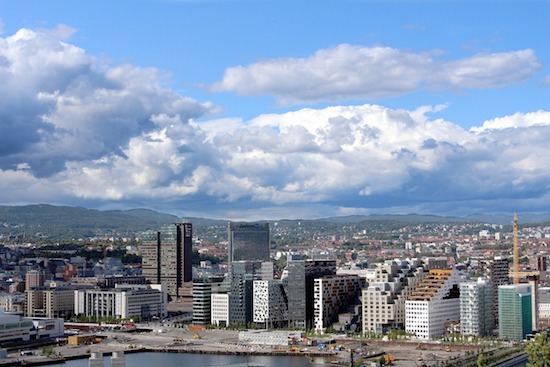 The entire area is around 350 metres above sea level which means you’ll get a very beautiful panoramic view of Oslo. The Norwegian Museum of Magic is the place to visit for those interested in magic. Here you can learn all about Norwegian magicians and see posters, photos, programmes and newspaper excerpts of magic and various costumes and other magic props. On Sundays, you can even see a little magic show. This place is perfect to take children as it will fascinate both young and old. Not so far from the main station, one finds Oslo Opera House. This building has won awards for its architecture and is one of the most popular attractions among tourists in Oslo. The Opera House is open every day and it’s completely free to enter. Visitors also have the opportunity to go up on the roof to get a nice view of the city and the Oslo fjord. For those who want to sit back and watch a live opera performance, there are tickets to buy on the spot. Unsold tickets can be purchased the day of the show at a lower price. About 20km south of Oslo is the amusement park Tusenfryd . Tusenfryd is Norway's largest amusement park, and there are several popular rides and everything else that goes with a typical amusement park. One thing that separates Tusenfryd from other theme parks is the unique Viking country, a part of the park that is completely focused on the Viking era. Visiting Vikinglandet may include visiting a Viking market, a vViking forge or use of Viking swords and shields. Tusenfryd is located in Vinterbro and can be reached most easily from central Oslo by bus. Kaffebrenneriet's place in Oslo is the place to go to for coffee lovers. In this café, you can try different coffees from around the world in a cozy environment. It also contains everything you need for a full afternoon tea with cakes, yoghurt and much more. Kaffebrenneriet is an excellent place to visit in the afternoon for a real coffee experience. If you have other things on the agenda and no time to sit down, they also offer take-away. Aker Brygge is an area in the central district of Frogner which includes a marina and a shopping centre. The marina, full of boats in a lovely marine environment, is a nice to place to visit on sunny days. Here you can wander around the modern port on pontoons that are filled with large and small boats. Around the port area there are restaurants, cafés and bars. The area is also completely free from motor traffic. At the mall you will find various shops, restaurants, a cinema and much more. Oslo's cultural district is called Grünerløkka and this is an exciting urban environment with lots for the visitor to explore. Among other things you’ll find several small restaurants, bars and cafés along the streets. For those who want to shop in locations a little more exotic than the big malls in Grünerløkka, you’ll also find several small shops, with everything from design to clothing. The nightlife is also special in this neighborhood and much of the music is played by different bands performing in the bars. Many of the cafés are open late, and sometimes have live music. A cool retro bar to visit is the Boca Bar which serves tasty cocktails and often features live performances. For those who are interested in plants and flowers or just want to relax from the streets of Oslo, the botanical garden is the place to go. In a relaxing setting you can wander among different flowers, shrubs and trees. In total there are thought to be over 7,500 plant species in the garden and the variety of species is great. The garden is not only a nice place to visit during the summer when everything is in greenery, but also in autumn when the botanical garden with all its colours is very beautiful.